Solomon Ibn Gabirol (1021-1058) of Spain was a Jewish philosopher and moralist who is perhaps best known for the beautiful forty-stanza poem Keter Malkhut (The Kingly Crown). 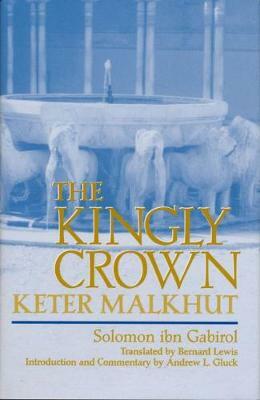 Hailed by scholars as one of the most important classics of Hebrew literature, The Kingly Crown employs the metaphor of a king in his palace to describe the relationship between humanity and God. This medieval poem is full of vivid imagery and scriptural references. Within its many layers of meaning, readers will find not only an extended prayer and meditation, but also signs of the neoplatonic philosophy that formed the foundation of Gabirol's cosmology and theology. The University of Notre Dame Press is pleased to bring back in print Bernard Lewis's lyrical translation of The Kingly Crown. This new edition includes Lewis's extensive notes and introduction as well as a new introduction, notes, and detailed philosophical commentary by Andrew L. Gluck, Gluck's meticulous correction of errors in the Hebrew text makes this the most accurate version ever published with an English translation.